Night no. 2 of The Dance Salad was Friday, April 18th. One great treat was being able to meet up with Nichelle from Dance Advantage! I am still amazed that real friendships can be born of talking about dance on the internet but it really can! The relationships we forge online in places like Twitter and Facebook can truly produce friendships in real life and I’m really amazed and grateful to find like minds and souls, like Nichelle, all over the world. Act 1 opened with Royal Danish Ballet and Bournonville. An interesting way to open the evening and I still loved it. Then we immediately moved on to Manuel Legris and my happiness. Neumeier’s Sylvia pdd with Laetitia Pujol. Paris Opera in Sylvia. Photo by Helmut Fohringer. Let me take a minute to divert to a little side thought right here: my Manu hopped a pirouette. I’ve never seen him not turn perfectly and beautifully before. I’m not sure how many people would notice but I’ve seen this pdd a lot and I know this choreography by heart. It didn’t seem to bother him at all and the rest of the pdd was flawless as usual. Now don’t get me wrong, I don’t relish seeing people that I love or care about make mistakes, I always hope for the best for everyone. BUT it’s a little comforting to know that even professionals, even dancers who are flawless, make mistakes and when they do, they keep going. When a beautiful dancer hops a pirouette, he doesn’t threaten to quit taking ballet class, she doesn’t tear herself down and question every and all dancing skills, he doesn’t whine about sucking, she doesn’t believe that she won’t ever be able to pirouette again and he doesn’t think the entire performance (or class) was awful because of one mistake. They keep dancing. So there we are, lesson for the day. Next up was Sorrowful Song performed by Beijing Dance/LDTX. 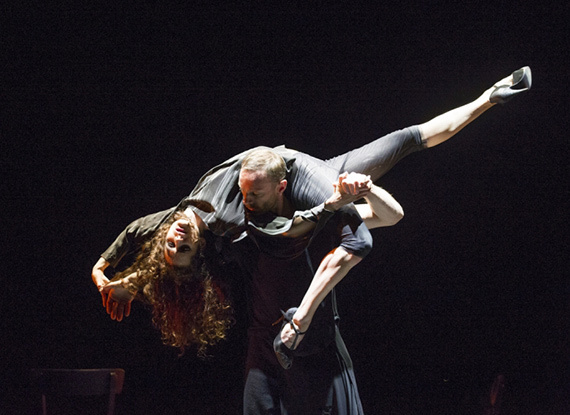 I feel this choreography all the way through my soul and it’s so gorgeous and so painful, it’s hard to breath. 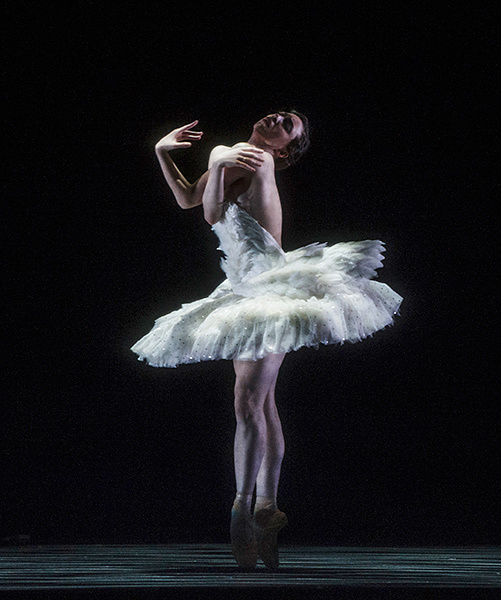 I’m not even recovered when Cygne performed by Samantha Lynch of the Norwegian National Ballet begins. 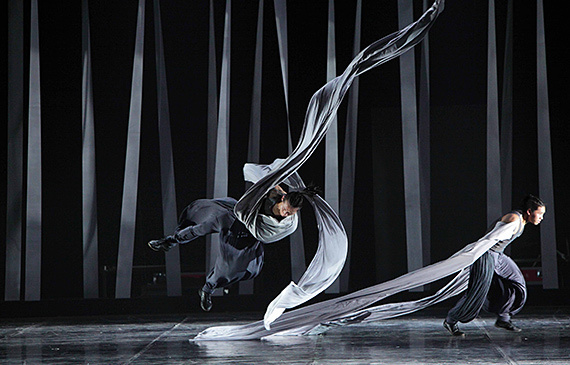 The choreography is by Daniel Proietto and it is an ode to Dying Swan. The piece begins with a curious image of a boy on a screen and then images of the ballerina. From the moment Sam Lynch starts dancing, I am entranced by her. She is tall with long, long limbs that move between unearthly grace and a frightful ability to flail radically and wildly as if no longer attached. The juxtaposition of perfect swan ballerina loveliness against the angular jutting of neo-classical/contemporary positions is as striking as the ballerina’s black hair against her whitened skin. It is pain, it is perfection. Entranced, I realize that a boy is singing Tennyson’s Dying Swan. Is that live? It can’t be. It is. A boy’s soprano is devastatingly beautiful as a swan is dying. It is a perfect performance, the kind that takes you completely out of the audience and there is nothing but the stage, almost an out-of-body experience where the art pulls you out of reality and into another world completely. The entire audience has forgotten how to breath as the swan finally collapses her wings, there is a moment of amazed silent, and then the entire place erupts in applause. Cygne. Samantha Lynch. Photo by Erik Berg. We are besides ourselves as an audience but we regain composure enough to be offered the Royal Danish Ballet in a piece called Traditional. It was anything but. 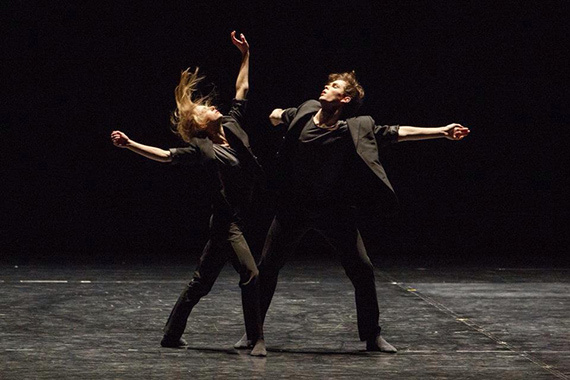 A contemporary piece, it is choreographed by Alessandro Sousa Pereira. Ida Praetorius and Andreas Kass in black pants and tops slink, slide, and move each other about the floor. It’s a great work that showcases this very young talent. It would have been neat to watch the two Royal Danish offerings back to back to contrast the purely classical with the contemporary. Royal Danish Ballet. Photo by Bruce Zinger. We end Act 1 with the Contemporary Dragon KungFu Dance Company performing Gateway and the audience adores them. Contemporary Dragon KungFu Company. Photo by Li Huimin. Youth is not a period of life. Because we have deserted our ideal. Years wrinkle skin; renouncing our ideal wrinkles our soul. And become dust before the death. At first, I didn’t really like this piece, with its use of film and the girl who wears a top, doesn’t wear a top, then wears a top again. Why? Lots of angularity, lots of lost-ness, dancers moving lights about on stage. I’m not sure… it’s a work to watch carefully and then think about. In the end, I usually really like dance that makes me work for it, that dares me to dislike it, that makes me think and that sends me on a trek of emotions and mind. Good for you Elephant and Monsieur Dury. Elephant in a Black Box. Photo by Ignacio Urrutia. We close with tango. I’m still not a big fan but it has its moments. Milonga. Photo by Tristram Kenton. **All images are property of The Dance Salad and the Photographer.